Trainspotting Generation: Heroin Woes of the Over 40s. During the 1980s and 1990s cheap heroin arrived on our shores here in the United Kingdom from places as far afield as Pakistan and Afghanistan. The influx of this deadly drug was accompanied by harsh recessions and general industry decline in a Thatcher era Britain. The once great mining and docking cities of the North were all but obliterated. This sorry state of affairs was immortalised in Irvine Welshes’ 1993 book ‘Trainspotting’ and subsequent film of the same title. And believe it or not, many of the same heroin addicts are still on the street scoring crack and/or heroin to this very day, despite the rise of many heroin treatment programmes and an array of ‘tools’ such as Methadone and buprenorphine. Although the number of heroin addicts has, according to the National Treatment Agency (NTA), fallen below 300,000 for the first time since 1997, a massive third of their numbers consists of over 35 year olds. Many of these addicts are homeless and suffer from a variety of mental illnesses. This group has rather unfortunately been coined the ‘Trainspotting Generation’ amongst popular press outlets in the UK. Here at Help4Addiction we thought the ‘Trainspotting Generation’ idea would be an interesting topic to cover, not least because many of the current articles on the subject around the internet are now over five years old. It makes sense to look at some of the more recent statistics published since. The stats in England and Wales for both men and women do indeed show that the ‘Transporting Generation’ trend is probably set to continue. 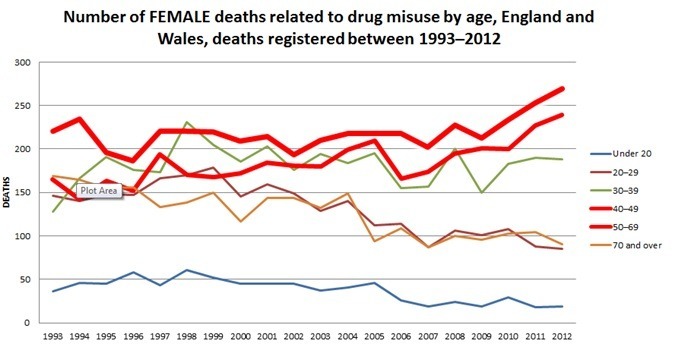 Below, Office of National Statistics data shows a rise in drug related deaths for over 40 year old males whilst a decline for other age groups over the same period. And this sorry state of affairs equally exists for women addicts over the age of 40. Below the Office of National Statistics data illustrates a rise in drug related deaths for those over 40 years old amongst females in England between 1993 and 2013 whilst a showing a decline for other age groups over the same period. The below statistics, sourced from Public Health England, shows trends in age group and drug group among the entire treatment population from 2006 to 2013 in England. The number of patients aged 40 or over has increased from 32,406 to 65,339. This means that in 2012-13 10% of the adult treatment population were aged 18-24 and 34% were aged 40 or over, compared to 19% aged 18-24 and 18% aged 40 or over in 2005-06. If you pop over the border, the situation is equally bleak for those over 40 years old in Scotland. Below, National Records of Scotland, shows a rise in drug related deaths for those over 40 years old in Scotland between 1996 and 2013, whilst showing a decline for other age groups over the same period. So the statistics show in England, Scotland and Wales that the this trend is set to continue in the absence of some change in policy at the heart of society. Is this label ‘Trainspotting Generation’ helpful? “The term itself conjures images of a young, rough-and-tumble generation of hard-core substance abusers. The over 40 and addicted crowd doesn’t really fit that mould, so I think the label is intrinsically confusing” concluded Dinker. A ‘chicken or the egg’ scenario? Robert Weiss, Clinical Director at Long Beach, California’s Elements Behavioral Health Systems, feels the ‘Trainspotting Generation’ is merely due to the fact that a stubborn element simply refuse to ‘give up’; something that gets stronger as an addict ages in their ‘ways’. “Addiction is an equal opportunity affliction. It does not discriminate based on age, race, gender, religion, financial status, social status, or anything else”. “Sadly, most addicts wait far too long to seek treatment — if they ever seek it. This “Trainspotting Generation” you’re asking about may be just another example of that,” said Weiss. Bill Dinker of Discovery Place feels that placing ‘blame’ for this situation is complicated, and woes of the ‘Trainspotting Generations’ should be viewed in context of the advantage younger groups have when it comes to kicking their habits, advantages which are often not available to their aging counterparts. “I think failure is a two-sided coin. It’s easy to place blame here or there, but more difficult to recognize shortcomings across the spectrum. Lack of funding is a major issue” Dinker said. “And Youth tend to have the advantage of financial support from parents. But the over 40 crowd often lacks this asset”. “So we’re left with the worst-case scenario: cases of chronic substance abuse with inadequate resources for care” concluded Dinker. Los Angeles based Anna David, Founder of AfterPartyChat, feels the trend is due to the unique psychology of this demographic. “The older people get, the less likely they are to be willing to change their ways. There are exceptions—we’ve done stories on seniors who actually get sober—but the more heavily committed people are to their lifestyles, the harder it becomes to change it” she said. It’s likely a long term solution to this ‘scourge’ may be need at the law making level. Some have looked to the model in Portugal, where the number of opiate related drug deaths has fallen consistently since the drug was de-criminalised in 2001. If you’re over 40 and suffering from an addiction to heroin, contact the Help4Addiction admissions team today. You can reach us on 0203 955 7700. If you enjoyed the above blog article, make sure to leave a comment below and press the social share buttons on the left. Instituto da Droga e da Toxicodependência de Portugal (Institute on Drugs and Drug Addiction of Portugal), “The National Situation Relating to Drugs and Dependency,” 2006 Annual Report (2007), p. 31.